Automotive News' four-part series on auto dealers enduring the Great Recession and its coverage of China's rising influence over the global auto industry were honored Friday with a pair of Jesse H. Neal Awards, which recognize editorial excellence in specialized business publications. 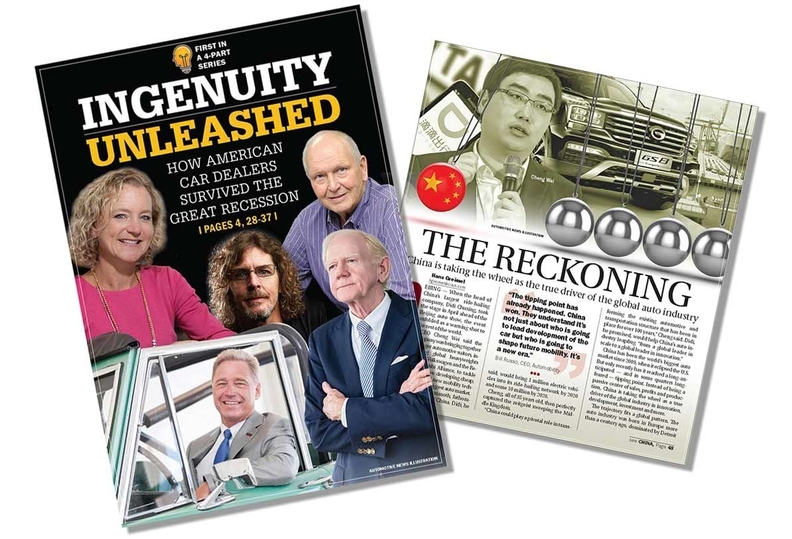 The Best Series award, the second in a row for Automotive News, was given to "Ingenuity Unleashed," which comprised more than two dozen profiles of dealers and their recession survival strategies. The project was led by former Print Editor Richard Johnson and former intern Alexa St. John, with contributions from an expansive team of Automotive News reporters. The entry competed among publications with annual brand revenue of more than $7 million. "Ingenuity Unleashed" was also first runner-up for the Grand Neal, the best-in-show award that marks the pinnacle of achievement in business-to-business media. China's EV startups: Boom or bubble? Automotive News was also recognized as a finalist for the Best Subject-Related Package, Best Profile and Best Range of Work by a Single Author awards. The awards were presented in New York by the business information group Connectiv. In 2015, Automotive News took home a Grand Neal for its coverage of the General Motors ignition switch crisis. That marked the first Grand Neal for a Crain Communications Inc. publication. The 2018 Best Series winner focused on a pivotal time of change and was titled "Industry Redesigned."